Our series ‘The People of Zurich and their Money’ takes you along for the ride as we explore the Zurich of times past. Hans Vogler was involved in the promotion of a machine that was to revolutionize minting – but he gained no profit out of it. Much like a good DVD, this conversation comes with a sort of ‘making of’ – a little numismatic-historical backdrop to underscore and illustrate this conversation. Late summer 1568. 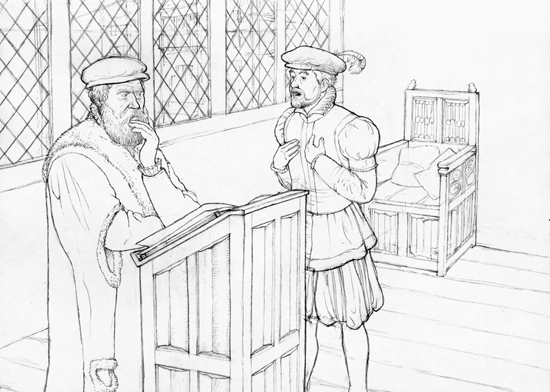 A clerk of the chancellery in Innsbruck informs Hans Vogler the Younger about the amount of money Emperor Maximilian II owes him for constructing his rolling mill. Drawn by Dani Pelagatti / Atelier bunterhund. Copyright MoneyMuseum Zurich. Clerk: Please, master Vogler, look at the invoices. They’re absolutely correct. 796 gulden for all my labor?! This can’t be true. I’ve built a working rolling mill for your sovereign! With my machine the mint of Tyrol is now equipped with the latest technology. And I shall receive for this marvel of engineering only 796 gulden?! Master Vogler, I’m sorry. But the greater part of the money has been paid already. This damned Rordorf! He nailed my reward. Then, when we founded our association seven years ago, I never thought that it could end in a quarrel like this. Why did you team up with a person like Rordorf? Then in Zurich in 1561 we were five founders of an association for commercializing the new roll mills. Jakob Stampfer, the mint master of Zurich made use of such a machine. The coins he produced were better than coins struck traditionally with the hammer. We thought that there was a market for such technology! Of course, the demand for coins grew enormous. All sovereigns thought of how to rationalize their mint. Indeed, many engineers traveled from court to court carrying in their luggage drafts of machines which normally didn’t work. They made a lot of money. We thought that we also could make a profit by offering a really working rolling mill! And then you had arguments? Yes – both Stampfer and Rordorf wanted to make a lot of money. They tried to do each other out of the clients, instead of dictating the price together! And the council of Zurich supported Stampfer. Yes, the Lord of Rappoltstein showed me the letter of the Zurich council warning him of Rordorf. But nevertheless you engaged him. 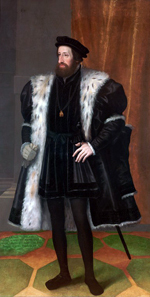 Yes, Ferdinand II – God have mercy upon his soul – entrusted Rordorf with building a rolling mill. But we were careful. We promised him a reward of 1500 gulden besides the expenses, which he should receive not before the new rolling mill was working. Yes, and he failed to do so. But his efforts cost money. He received advances. He’s spent my money. And I’ll go bankrupt with these ridiculous 796 gulden. 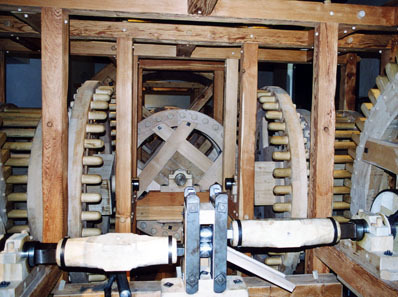 Reconstruction of a rolling mill, constructed by Werner Nuding, on display in the Hall Mint Museum in Hasegg Castle. In the summer of 1562, three natives of Zurich teamed up to promote a technology that promised to yield substantial profits, a new rolling mill that allowed the production of better coins in less time with less effort. The partners of this consortium were Jakob Stanpfer, mint master in Zurich since 1561, who already made good use of this new minting machine, Rudolf Rordorf, an engineer who was engaged in the construction of rolling mills, Martin Rosentaler, another minting technician, Jakob Bluntschli, a carpenter – after all, the most important material of roller minting presses was wood – and Hans Vogler the Younger. Why the latter was accepted into this community is a mystery. His education would have made him quite a good secretary in a chancery. He had studied under Heinrich Bullinger in Zurich and Simon Grynäus in Basle but didn’t distinguish himself. According to the evaluation of Grynäus the young man was intelligent, all right, but didn’t manage to dwell on anything and constantly abandoned himself to impulses. This unsteadiness remained a constant in Vogler’s further life. It took him to the different royal courts in Europe until, in 1558, he eventually asked Heinrich Bullinger ruefully to put a good word for him in Zurich. He would have been only too pleased to hold an office in Zurich, his native town. And he was quite sure that he was able to serve the people of Zurich well. After all, on his journeys he had gained considerable knowledge about how to mingle with the big wigs in the world. There was no office available for him in Zurich, but – perhaps thanks to his eloquent demeanour – the fellow consorts decided to accept him into their circle. Most likely every member of this consortium realized how important it was to present their own machine to the princes in a proper way – you see, the men from Zurich weren’t the only ones who had built a rolling mill. After the rack had gained currency in the second quarter of the 16th century, it was but a small step to the rolling mill. From the middle of the 16th century onwards, several so-called mint artists appeared on the scene who presented the European royal courts new machines for coining. They were all based on the rolling mill principle: a long metal strip ran through two rollers that ‘minted’ the strip with images on both sides. This new technology’s difficulty was in the detail: how to produce enough pressure needed to achieve the proper minting depth? How to cut the dies needed to achieve a circular imprint? How to make the upper roller run at exactly the same pace as the one for the reverse? Emperor Ferdinand I (1503-1564), portrait by Hans Bocksberger the Elder (1510-1561). Kunsthistorisches Museum Vienna. Source: Wikipedia. Jakob Stampfer had solved most of these problems to a greater or lesser extent. Admittedly, when Ferdinand I, German emperor reigning between 1556 and 1564, provided him with the opportunity to present his minting machine, the ones responsible judged his technology as not yet mature because the machine needed considerable maintenance and reparations on a daily basis. Consequently, the emperor didn’t contract Stampfer but Rudolf Rordorf for installing a rolling mill although the latter hadn’t sampled his skills yet. That was probably the reason for a quarrel between Rordorf and Stampfer which became a matter for the Zurich Council in 1564. Stampfer and his sons had to manage all by themselves, since the other members of the rather short-lived ‘minting consortium’ likewise filed a suit against the mint master from Zurich. These conflicts needn’t concern us here, though. Let us turn to Rordorf and his rolling mill instead, which he promised the inhabitants of Tyrol to build. The cautious emperor had negotiated a contract with Rordorf that guaranteed the latter a reward of 1,500 gulden in case he successfully built and installed two minting machines. Exact numbers were laid down as to their projected mintage. The plan was that eight assistant would be able to mint 1,500 mark silver per week with the new machines. If only large-size silver coins were minted, that would have been more than 15,000 specimens, a huge number! But Rordorf’s promises turned out to be too optimistic. Hall in Tyrol, Mint Tower in the foreground. Photograph: Herbert Ortner / Wikipedia. In 1564, Rordorf traveled to Tyrol. After some initial mishaps the inventor lost interest – perhaps he realized that his own specifications were not practicable. In order to get out of that affair decently, he left a very distant relative behind whose actual profession was building organs but was appointed then to put the rolling mills into operation. 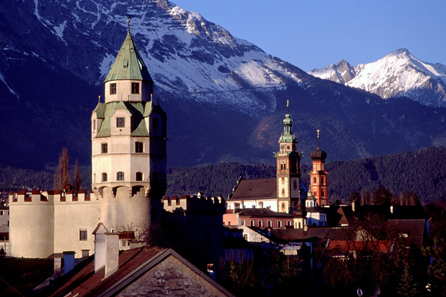 When he didn’t succeed, he absconded in April 1565 and left massive debts in Tyrol. The representative of Maximilian II finally found in Hans Vogler a replacement for the two halfhearted inventors. Thus, Vogler left Innsbruck in 1566 and – his lack of experience in the actual minting process notwithstanding – he really was successful and achieved what his two predecessors had failed to do: after only two months he had set a rolling mill in motion which surpassed everything Tyrol had witnessed hitherto. During a presentation spanning one single day Vogler and his assistant minted 2,057 guldentaler. Although that number was impressive in its own right, it was still far from the one stipulated in the imperial contract. Vogler had to work on improving the mechanism for two more years until the officials rated it as functioning properly and paid up. What followed was a rude surprise, as we stated in our audio drama. Although the chamber’s councils had raised the reward for building the rolling mill from 1,500 gulden to 2,000 gulden, they were unwilling to acknowledge Vogler’s expenses which he estimated at 2,000 gulden. They approved of 500 gulden only. In addition, they reduced the final payment by the sum already paid to Rordorf and his relatives. As a result, for his work of two entire years Vogler received just 796 gulden from which – and that was the real problem – he had to pay the remaining expenses adding up to 1,500 gulden. As quasi-compensation Vogler was granted a kind of imperial patent in 1569 on the installation of his minting machine. The value of that patent became apparent three years later: Konrad Kürschner, mint master from Konstanz, managed to prove that his own roller minting machine had nothing to do with Vogler’s and had been in use as early as 1565. Thus, for the ‘inventor’ Vogler the whole thing didn’t turn out to be a great bargain – quite the contrary. His heirs inherited debts adding up to 14,000 gulden. The technology of the rolling mill, on the other hand, proliferated. The ‘Tyrolean’ technology was exported not only to Spain but, from there, also reached the New World. The Tyrolean officials apparently even felt guilty because of the way they paid unfortunate Vogler. Anyhow, they settled a rent for his widow and his son who struggled through life as a not too successful painter. You can find all other parts of the series here. The texts and graphics come from the brochure of the exhibition of the same name in the MoneyMuseum, Zurich. Excerpts with sound are available as video here.